The strong and durable set is perfect for family gatherings as it can seat up to 6 people for dining and is also perfect for entertaining friends too! A large outdoor furniture set that includes two 5-foot benches and two 2-foot chairs. The strong and durable set is perfect for family gatherings as it can seat up to 6 people for dining. Each piece has a robust design and is finished in a sleek, smooth style - making it perfect for entertaining friends too! 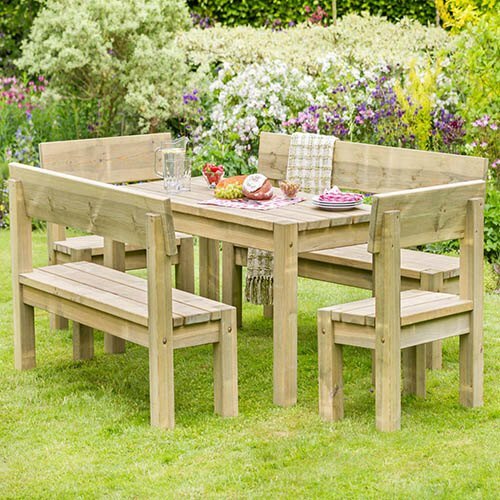 The Philippa Table and Bench Set is manufactured from high quality, pressure treated, FSC® Certified timber to last longer, and comes with 10-year guarantee against rot so you can be sure that this product will last the test of time and remain a beautiful feature in your garden. Dimensions: 0.80m X 0.62m X 0.845m, assembly required - This product is 2-person assembly.